After creating the Hulk, Stan Lee wanted to up the ante. But when you've already got the strongest man in the world, how do you out-do that? But not making a new man at all, but going instead for a god. Arguably the most powerful hero in the Marvel Universe and loyal Avenger, Thor is the son of Odin and the Lord of Asgard, Realm of the Gods. He first came to Earth nearly two thousand years ago to lead the Vikings in battle, and has since returned many times in the guise of both god and mortal. Through it all, his long war with his stepbrother Loki has never abated, with the evil trickster god laying snares for the hero at every turn. Thanks to Thor's friends among Earth's Mightiest Heroes, the Avengers, and his legendary hammer Mjolnir, Loki has always returned to Asgard hanging his head in defeat. It's important to note that Thor isn't a pretender, someone just using a god's name because it makes him sound cool. This is the actual Norse god of thunder, the very same one worshiped ages ago by the Scandanavians. He lives in the real Asgard, is the son of the real Odin, and commutes to work on the real Bifrost bridge. It'd be like if Jesus joined the JLA. An actual deity acting as a superhero. Thor is a fairly large ML, right up there with the biggest of 'em. His helmet tops out at 7¼" tall, but the wings add more than a quarter inch to that total. Impressively, that's the same size as the first Marvel Legends Thor, reinforcing that they're supposed to be the same guy. The figure is well articulated, with one noteable absence. He moves at the neck, shoulders, elbows, wrists, torso, waist, hips, knees and ankles. It's better than it sounds, since the elbows and ankles are both balljoints, rather than hinges, and he's got double knees. The wrists are balljointed, too, but you still can't move them the proper way to have him point his weapons at an enemy. The elbows are nice, but you'll still miss the swivels at the top of the biceps. Unless you remove Thor's cape, his head is impeded by his long hair. So overall, the articulation is acceptable, but could be better. Given the figure's large size, the detailing of the sculpt is no surprise. This particular version of Thor is taken from a fairly recent story arc in which Thor had taken over for his father as ruler of Asgard, and was feeling militant. Reflecting that, his boots are armored, rather than simple cloth wraps, his shirt is armored mail and even the discs on his chest are thicker and strung with (sculpted) chains. His cape has fur trim across the shoulders, and his helmet has been redesigned to provide more protection. He's even grown a beard, since he doesn't really have time to worry about daily personal grooming. Thor has two weapons, instead of just one. 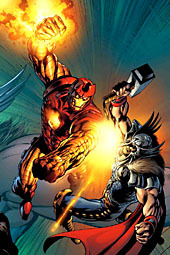 The first is his mystic uru hammer, Mjolnir, which looks like it's been beat to hell over the course of many battles. The handle is wrapped with leather, and the strap at the end - which Thor uses to swing the hammer - is open wide enough to accommodate his hands. His other weapon is a huge battle axe, one that's easily bigger than his torso. The two heads have different styles, but both are sculpted with scratches and gouges to suggest use. Either weapon can be held in either hand, making Thor quite the formidable opponent. 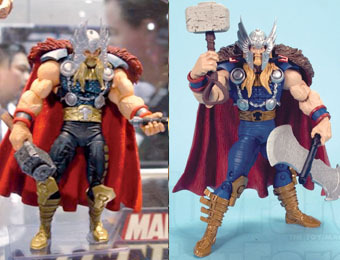 There were complaints about Thor's paint apps when we saw those infamous bad prototype photos. The previous shots we'd seen of him looked very good, while this new version left a lot to be desired. 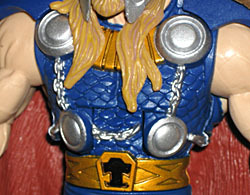 The two-up shown at SDCC had a metallic blue chest, black legs with gold bars, silver shoulder pads; the "official" photo was wearing plain blue, didn't even have the gold on his pants, and the axe was missing some paint apps. The final figure is somewhere between the two. His blues are flat, still, but the gold is back on his legs. The shoulders aren't silver, but the fur on the cape isn't red, either. The axe has its detailed apps back, though it could have used a wash to bring out the rough detail. The use of blue instead of black isn't much of a problem, either, since that's what he was wearing in the comics. Incedentally, the fur on his shoulders is only brown on that cover - it was red inside the issue. His shoulders were even blue in the issue, meaning that the released version of the figure is more comic-accurate than the prototype. As part of Hasbro Legends 2, Thor comes with a piece of this series' BAF, Blob. In fact, he comes with a pretty key item: the guy's head. If you don't want any of the other figures in this series, you can always pretend Thor decapitated Blob with the axe - it's a clean line underneath. There are no joints on the piece, of course, but you can see where his neck balljoint will eventually find its home. Thor is a big, mighty figure, and he looks mighty good. The paint issues aren't as bad as we thought they were going to be, and the sculpt is great. 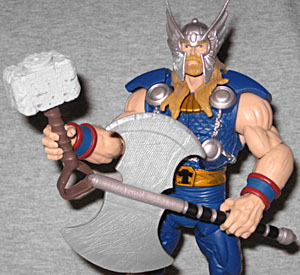 Sure, a little more could have been done with the paint, but that doesn't mean Thor looks bad. The weapons are cool, and the figure will be a fine addition to your collection. 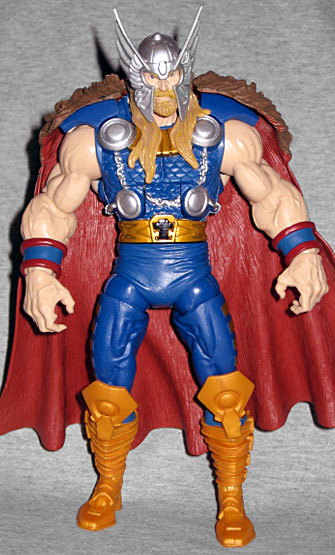 Remember, this is what Thor was wearing when Iron Man came after him in the Thorbuster Armor, so if you got that figure from ML15, this is a great companion piece.